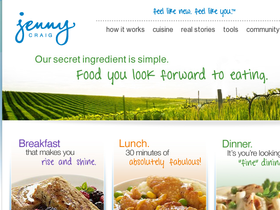 Visit Jenny Craig online at JennyCraig.com for a premier weight loss program personalized to your desires. Jenny Craig has delicious gourmet meals and snacks that are sure to please. Jenny Craig's one-on-one support will help you meet your goals with confidence. Save on your next purchase from JennyCraig.com with discounts, coupons, promotions and savings from 58coupons.com. Head on over to JennyCraig.com and sign-up to lose 20 pounds for $20. Click link for details. Right now Jenny Craig is offering free phone consultations. Click link for info. Go to JennyCraig.com to read free articles & tips on weight loss. Click link for details. Right now JennyCraig.com is offering free access to their eTools which is valued up to $15 per month. Click link for details.